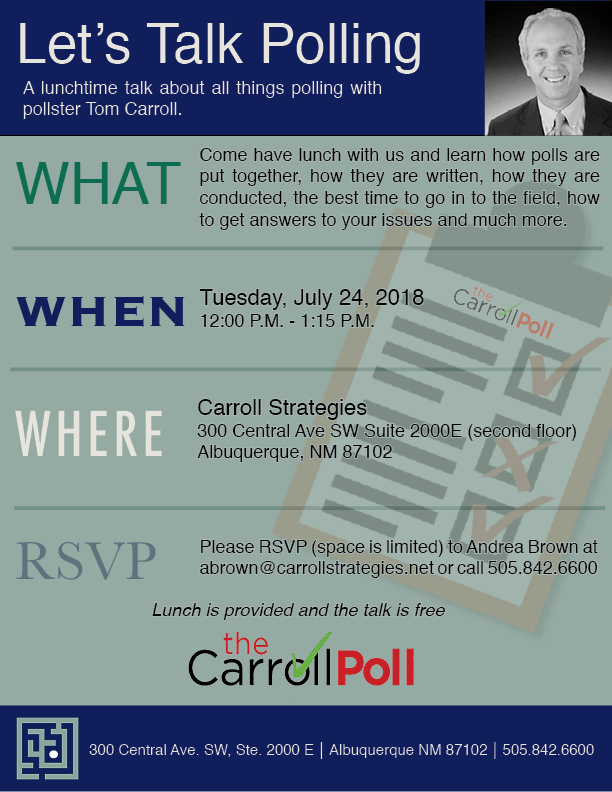 Albuquerque, NM, Sept. 21, 2016 - The newest Carroll Strategies Poll by Carroll Strategies, an Albuquerque Public Relations firm, shows that 94.8% of local residents are aware of the 2014 shooting by two officers of homeless camper James Boyd. But, the poll also shows that only 50.1% of residents agree with the District Attorney's decision to press charges. The poll, done Monday and Tuesday, Sept. 20 and 21, was an auto-response poll of 403 residents of Albuquerque. It has a margin of error of 4.88%. "The poll shows that nearly the entire city is aware of the shooting, and the trial," said Tom Carroll, president of Carroll Strategies. "It also shows that while many support the DA's decision to press charges, not everyone is in support of the move. It also shows that the nearly a third of Albuquerque residents don't support Department of Justice oversight over APD, nearly two years after an agreement was signed." The Carroll Poll also asked about public support for the state incentives used to lure the new Facebook Data Center to Los Lunas.